Cook rice in water in pot as directed on package, about 45 minutes in saucepan. 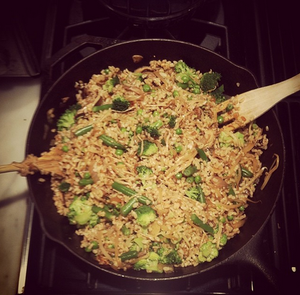 While rice is cooking, boil green beans, broccoli, bean sprouts each separately until tender but not overly soft and set aside in separate bowls. Heat large cast-iron pan. When pan is hot, add a pat of butter or oil, garlic and onion. When onions are translucent, lower heat and add vegetables. Saute for 3-5 minutes. Add cooked rice. Mix in vegetables well and add sesame oil, rice vinegar and tamari. Continue to cook for 5 minutes. Season with salt to taste.